Radiofrequency catheter ablation is a safe and presently a routine method for the treatment of arrhythmias. This practical atlas presents illustrative cases aiming to inform practitioners and aid in the management of their patients. This essential text is written by an international array of experts in this field and organized by the Reunion of European countries for the Treatment of Arrythmias in Cardiology (RETAC). 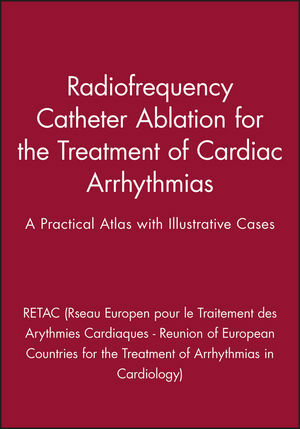 RETAC (Réseau Européen pour le Traitement des Arythmies Cardiaques - Reunion of European Countries for the Treatment of Arrhythmias in Cardiology) is the author of Radiofrequency Catheter Ablation for the Treatment of Cardiac Arrhythmias: A Practical Atlas with Illustrative Cases, published by Wiley. Chapter 1. Atrioventricular Node Ablation. Chapter 2. Atrial Tachycardia and Tachycardiomyopathy. Chapter 3. Permanent Right Atrial Tachycardia. Chapter 4. Catheter Ablation of a Right Atrial Incisional Tachycardia. Chapter 5. Permanent Left Atrial Tachycardia. Chapter 6. Catheter Ablation of Typical (Type I) Atrial Flutter. Chapter 7. Clockwise (Atypical) Atrial Flutter. Chapter 8. Counterclockwise (Typical) Atrial Flutter. Chapter 9. Incisional Tachycardia and Atrial Flutter after Orthotopic Heart Transplantation. Chapter 10. Atrial Flutter Ablation in a Heart Transplant Patient. Chapter 11. Catheter Ablation of Focal Atrial Fibrillation Originating from The Pulmonary Veins. Chapter 12. Focal Paroxysmal Atrial Fibrillation. Chapter 13. Ablation Atrial Flutter Ablation During Sinus Rhythm. Chapter 14. Catheter Ablation of a Parahisian Accessory Pathway. Chapter 15. Catheter Ablation of an Accessory Pathway with Anterograde Decremental Conduction Properties. Chapter 16. Right Posteroseptal Accessory Pathway Ablation. Chapter 17. Accessory Atrioventricular Pathway in Ebstein's Anomaly. Chapter 18. Right Posteroseptal Accessory Pathway. Chapter 19. Catheter Ablation of a Right Posteroseptal Accessory Pathway During Atrial Fibrillation. Chapter 20. Catheter Ablation of a Left Lateral Accessory Pathway through a Patent Foramen Ovale. Chapter 21. Catheter Ablation of a Left Posteroseptal Accessory Pathway in a Patient with Aortic Stenosis. Chapter 22. Catheter Ablation of a Left Lateral Accessory Pathway. Chapter 23. Left Lateral Concealed Accessory Pathway. Chapter 24. Catheter Ablation of a Right Posteroseptal Accessory Pathway. Chapter 25. Permanent Junctional Reciprocating Tachycardia. Chapter 26. Permanent Junctional Reciprocating Tachycardia. Chapter 27. Mahaim-Type Ventricular Preexcitation. Chapter 28. Atriofascicular Mahaim Fibers and Ebstein's Anomaly. Chapter 29. Catheter Ablation of Mahaim Fibers. Chapter 30. Slow-Fast Atrioventricular Node Reentrant Tachycardia. Chapter 31. Three Forms of Atrioventricular Nodal Reentrant Tachycardia in the Same Patient. Chapter 32. Atrioventricular Node Reentrant Tachycardia in a Patient with Dextrocardia. Chapter 33. Catheter Ablation of Typical and Atypical Atrioventricular Node Reentrant Tachycardia in the Same Patient. Chapter 34. Right Ventricular Outflow Tract Tachycardia. Chapter 35. Idiopathic Left Ventricular Tachycardia: Radiofrequency Catheter Ablation Guided by a Purkinje Potential. Chapter 36. Bundle Branch Reentrant Ventricular Tachycardia in a Patient with Steinert Disease. Chapter 37. Ventricular Tachycardia in Arrhythmogenic Right Ventricular Cardiomyopathy. Chapter 38. Post Infarction Permanent Ventricular Tachycardia.